Kraan has been going strong since their debut in 1972 around the core of bassist Hellmut Hattler and brothers Peter Wolbrandt (guitar) and Jan Fride (drums), and although their studio work has had its ups and downs (mostly the former, save a few albums in the 80s) their live releases have always been a sure bet, from their original Live in 1975 (when the band featured Johannes Pappert on sax), to 1980’s Tournee, this time with keyboardist Ingo Bischof, then out to Live 88, when Joo Kraus (trumpet, keyboard) was the fourth man in the lineup, to Live 2001 when Bischof had again returned to the lineup on keys. Across all of these, Kraan was always a four-piece unit. But at the end of 2007 when Bischof left the second time, they decided not replace him and go forward as a trio, and thus we have the latest Kraan album, The Trio Years that was recorded at various dates between 2008 and 2017, although for each of the dozen cuts here, no detailed information is given as to when and where it was recorded, instead relying on engineers Thierry Miguet, Juergen Schlachter, and others to join everything together so it sounds like it was all taken from a single concert. Indeed many of the cuts here, like the side-long “Nam Nam,” “Hello Ja Ja, I Don’t Know,” “Holiday Am Matterhorn,” “Andy Nogger,” and “Jerk of Life” have featured on most of Kraan’s previous live offerings, and it’s fun to listen to the various live recordings back to back to note the differences, and it’s hard to come away with any other conclustion that this is probably their best live offering since the original in 1975. Some of the tunes here were culled from the last few studio albums, like “Club 20,” “Silver Buildings,” and “Akuda,” and “Wintruper Echo” that made it’s first appearance on the Nachtfahrt album back in 1982 gets the live treatment after all. 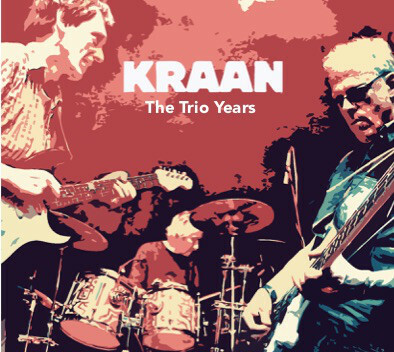 For those that don’t know Kraan’s music, it’s basically a funky helping of rock, jazz, and a bit of fusion, mostly instrumental, with occasional dadaist lyrics, stretched out into a jam band format. And of course, they do another version of the masterful “Dinner for Two,” essentially a duel between Wolbrandt and Hattler 100% on fire, every version slightly different throuh the years. Longtime fans and newcomers alike will find plenty here to get excited about.